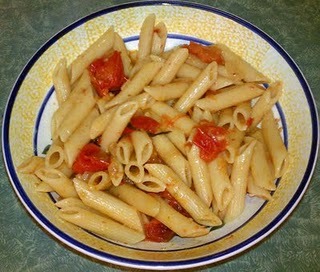 Easy Gourmet Recipes - Roasted Heirloom Cherry Tomato Pasta Sauce Recipe. Healthy natural recipes including breakfast recipes, appetizer recipes, soup recipes, pasta recipes, holiday recipes, party recipes, dessert recipes, gluten-free recipes, raw recipes and budget recipes. Thanks to Chef Elizabeth for sharing her organic roasted tomato sauce recipe with us! The roasted cherry tomatoes make such a rich and sweet sauce. If you use rice pasta or quinoa pasta, this becomes a vegan gluten-free recipe. 1. Set your broiler to high or preheat oven to 500. Begin to boil water for the pasta. 2. Separate the garlic cloves from the head but do not remove the paper from the individual clove. Cut the tomatoes in half and toss with the garlic cloves, olive oil and salt. 3. Line a baking pan with parchment paper and spread tomatoes and garlic to form a single layer. Broil or roast until tomatoes begin to caramelize, approximately 10 minutes. Remove pan from oven, flip tomatoes and broil again until browning begins. 4. While the tomatoes are roasting, cook your pasta. This is important because you want some of the pasta water for your sauce! 5. While the tomatoes are roasting, and the pasta is cooking, dice the onion and cook until translucent in a large pot with olive oil and salt. Be sure not to allow the onion to brown. 6. Add the cooked tomatoes and roasted garlic (don't forget to peel the cloves after they are cooked!). Use a wooden spoon to mash everything together and throw in a handful of fresh whole basil leaves. 7. When your pasta is done cooking, add one cup of the pasta water to your tomato sauce. Bring sauce to a good simmer/slow boil, stirring occasionally for 5 minutes. Add cooked pasta, stir, let sit for a few minutes.